The Malwarebytes research team has determined that Antivirus System is a fake anti-malware application. These so-called "rogues" use intentional false positives to convince users that their systems have been compromised. Then they try to sell you their software, claiming it will remove these threats. In extreme cases the false threats are actually the very trojans that advertise or even directly install the rogue. You are strongly advised to follow our removal instructions below. 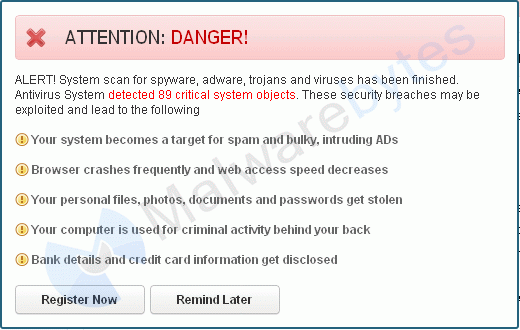 How do I know if I am infected with Antivirus System? How did Antivirus System get on my computer? How do I remove Antivirus System? Our program Malwarebytes Anti-Malware can detect and remove this rogue application, but because this rogue blocks the normal use of programs we will use Chameleon to remove it. If Malwarebytes Anti-Malware is not installed on the infected computer. In order for this to work, you could need a second PC which is not infected and a USB flash drive or blank CD and CD burner or some other means to transfer files from one computer to the other. Download Chameleon from the Malwarebytes site. Unzip the contents of the zip-file to a folder in a convenient location on the infected computer. If you were unable to do this directly on the infected PC, then copy the folder from the clean computer to the infected one. Make certain that your infected PC is connected to the internet and then open the folder you created or copied, on your infected computer and double-click on firefox.com. Next, double-click on firefox.com. This should result in a black DOS/command prompt window opening up. Below is what you can expect to see in the Command prompt after succesfully using Chameleon. Is there anything else I need to do to get rid of Antivirus System? The shortcut called Antivirus System on the desktop can be deleted if it belonged to the rogue. If you are unsure, compare the icon to the one posted above. As you can see below the full version of Malwarebytes Anti-Malware would have protected you against the Antivirus System rogue. It would have warned you before the rogue could install itself, giving you a chance to stop it before it became too late. Note: the startup-, file- and foldername are semi-random. "(Default)"="'"C:\Documents and Settings\All Users\Application Data\pavsdata\Antivirus.exe" /ex "%1" %*'"
"DisplayIcon"="'C:\Documents and Settings\All Users\Application Data\pavsdata\Antivirus.exe,0'"
"UninstallString"="'C:\Documents and Settings\All Users\Application Data\pavsdata\Antivirus.exe /tout'"
"InstallLocation"="'C:\Documents and Settings\All Users\Application Data\pavsdata'"
"avsdsvc"="'C:\Documents and Settings\All Users\Application Data\pavsdata\Antivirus.exe /min'"
HKLM\SOFTWARE\Microsoft\Windows\CurrentVersion\Uninstall\pavsdata (Trojan.FakeMS) -> Quarantined and deleted successfully. HKCR\.exe| (Rogue.PCDefenderPlus) -> Data: 4g -> Delete on reboot. HKCR\.exe| (Hijacked.exeFile) -> Bad: (4g) Good: (exefile) -> Quarantined and repaired successfully. HKCR\.exe| (PUM.HijackExefiles) -> Bad: (4g) Good: (exefile) -> Quarantined and repaired successfully. C:\Documents and Settings\All Users\Application Data\pavsdata\Antivirus.exe (Trojan.FakeMS) -> Quarantined and deleted successfully.